Frisco Wakeland Marc Borbonus scores on Valley View Christian Molina in the 1st half of play during in the Class 5A state semifinals at Birkelbach Field Thursday, April 19,2018 in Georgetown, Texas. GEORGETOWN — The Valley View Tigers aren’t used to trailing in a match. So when Frisco Wakeland built a two-goal lead just 1:18 into the second half, the Tigers were in unfamiliar territory. Even though Adrian Rodriguez scored 32 seconds later to pull Valley View within a goal, the Tigers couldn’t break the Wolverines’ tight defense and fell 3-1 in a Class 5A state semifinal Thursday at Birkelbach Field. The state semifinal produced situations the Tigers hadn’t come across very often in their previously perfect season. Their frustration was evident during the final 10 minutes. The Tigers weren’t prepared to let the year end. 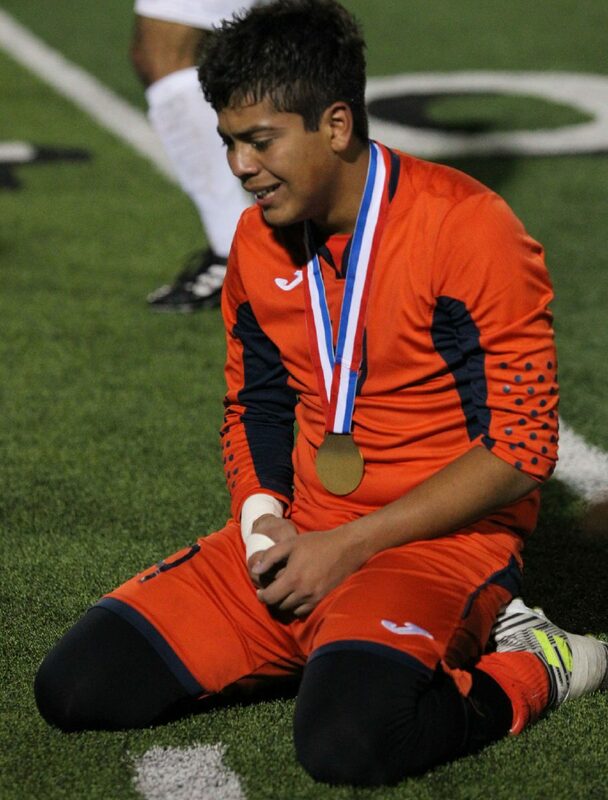 Valley View Christopher Flores sits dejected on the field as the Frisco Wakeland players celebrate their Class 5A State Semifinals at Birkelbach Field Thursday, April 19,2018 in Georgetown, Texas. 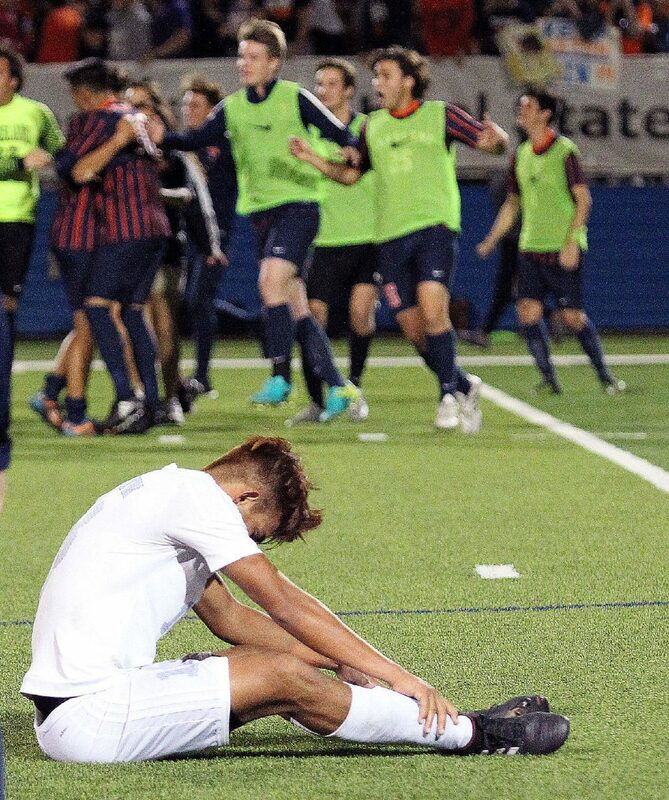 Valley View Elian Chavez gets emotional after their loss to Frisco Wakeland in the Class 5A State Semifinals at Birkelbach Field Thursday, April 19,2018 in Georgetown, Texas. 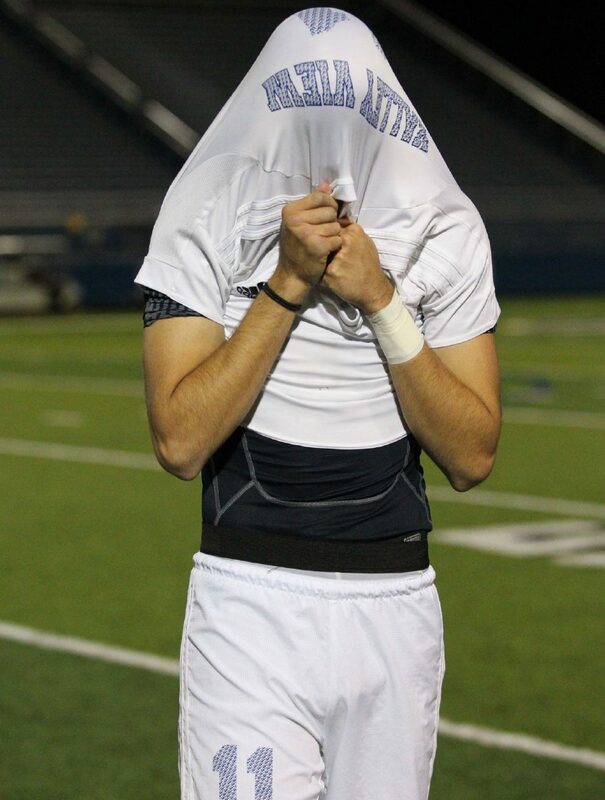 Valley View Adrian Rodriguez covers his head with his shirt after their loss to Frisco Wakeland in the Class 5A State Semifinals at Birkelbach Field Thursday, April 19,2018 in Georgetown, Texas. 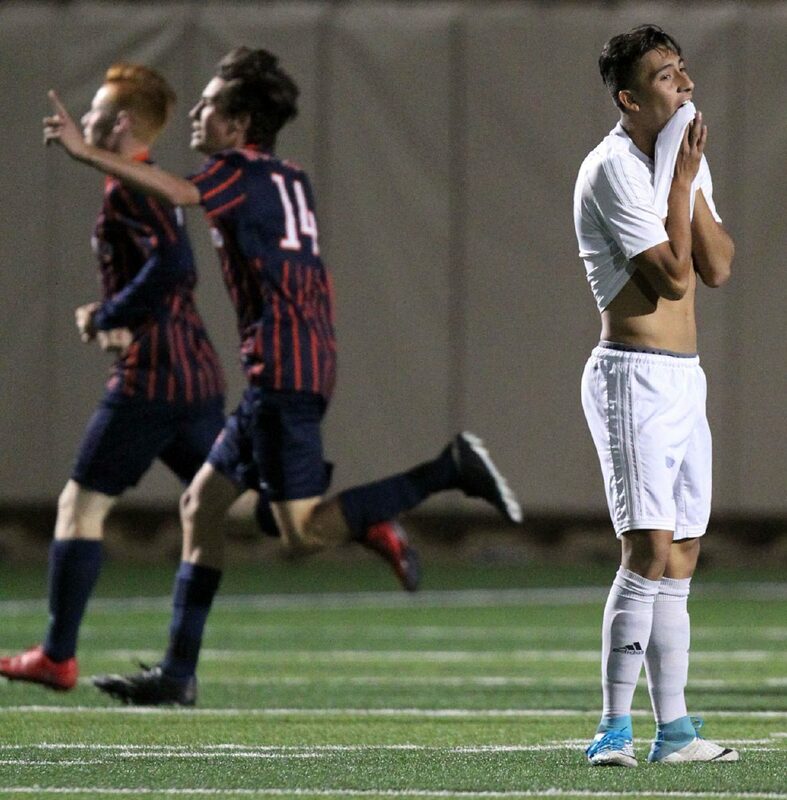 Valley View Ricardo Mata is stunned Frisco Wakeland scores in the 2nd half of the Class 5A State Semifinals at Birkelbach Field Thursday, April 19,2018 in Georgetown, Texas. 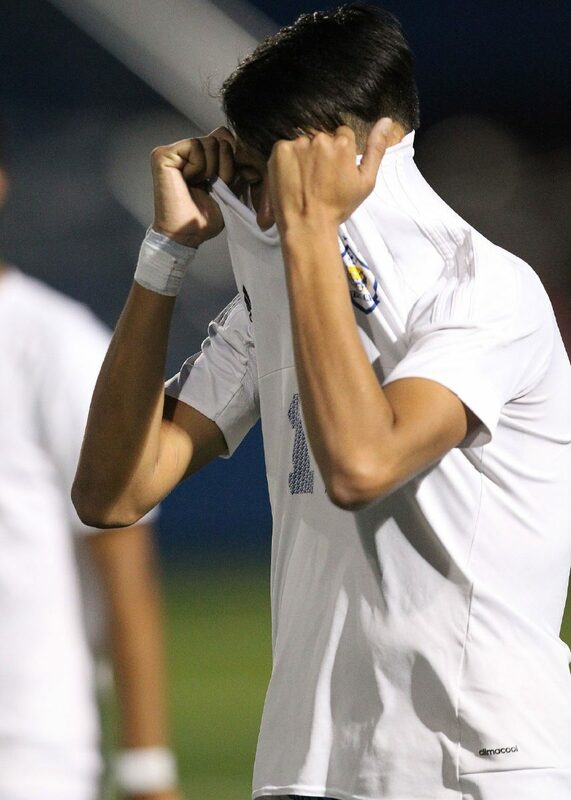 Valley View Mario De Los Santos covers his face after the loss to Frisco Wakeland in the Class 5A State Semifinals at Birkelbach Field Thursday, April 19,2018 in Georgetown, Texas. Valley View Edson Mata and Victor Urena defend Frisco Wakeland Alex Wing in the 2nd half of play during the Class 5A state semifinals at Birkelbach Field Thursday, April 19,2018 in Georgetown, Texas. 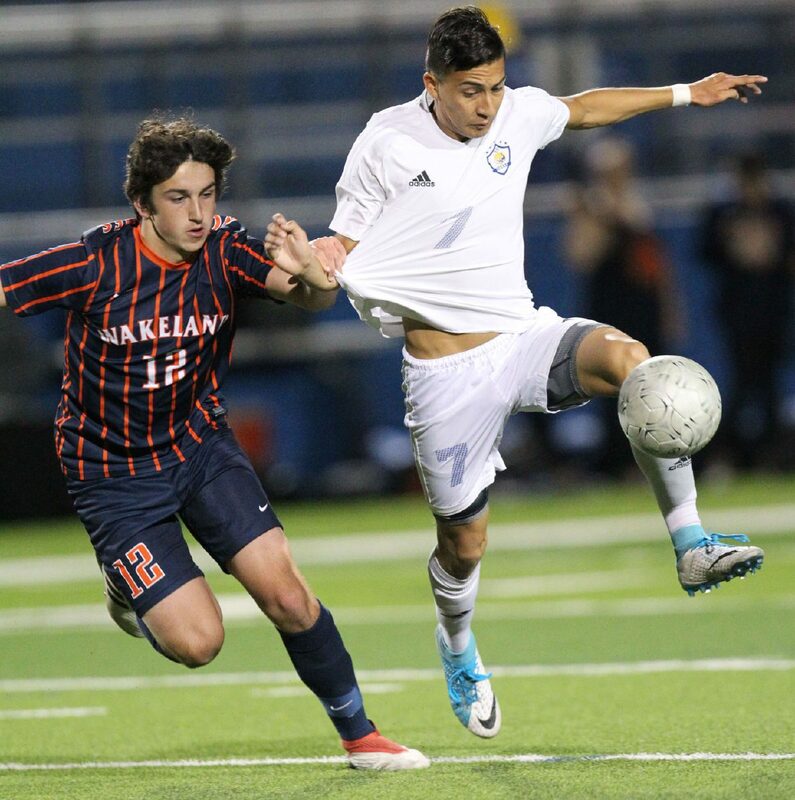 Valley View Emmanuel Acosta battles for position against Frisco Wakeland Bryan Bayles during the 2nd half of the Class 5A state semifinals at Birkelbach Field Thursday, April 19,2018 in Georgetown, Texas. Valley View Rogelio Saldivar, Emmanuel Acosta and Ricardo Mata argue with referee as he pulls a red card on Emmanuel Acosta during the 2nd half against Frisco Wakeland in the Class 5A state semifinals at Birkelbach Field Thursday, April 19,2018 in Georgetown, Texas. Valley View Ricardo Mata chases down a ball in front of Frisco Wakeland defender Jackson Ford in the Class 5A state semifinals at Birkelbach Field Thursday, April 19,2018 in Georgetown, Texas. 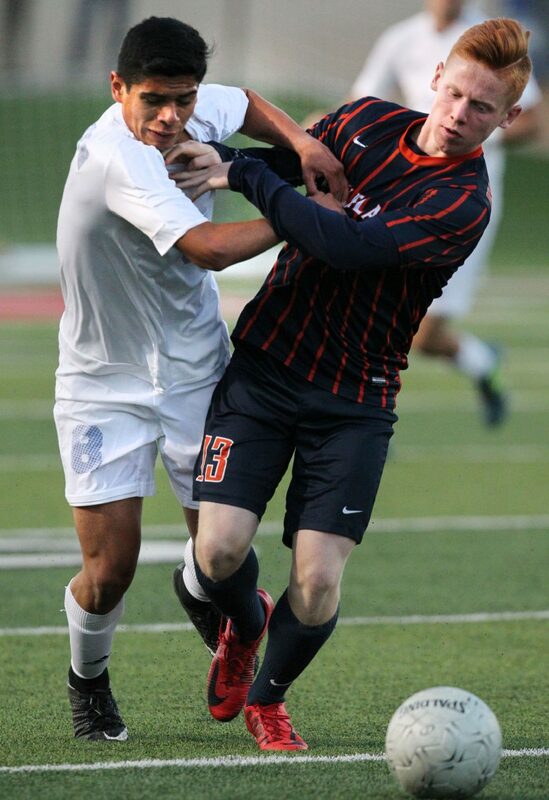 Valley View was assessed three red cards during the final 20 minutes of action, finishing with eight players. The game-changing disciplinary action began at the 66:28 mark of the match, with Valley View having already picked up three yellow cards to Wakeland’s two. 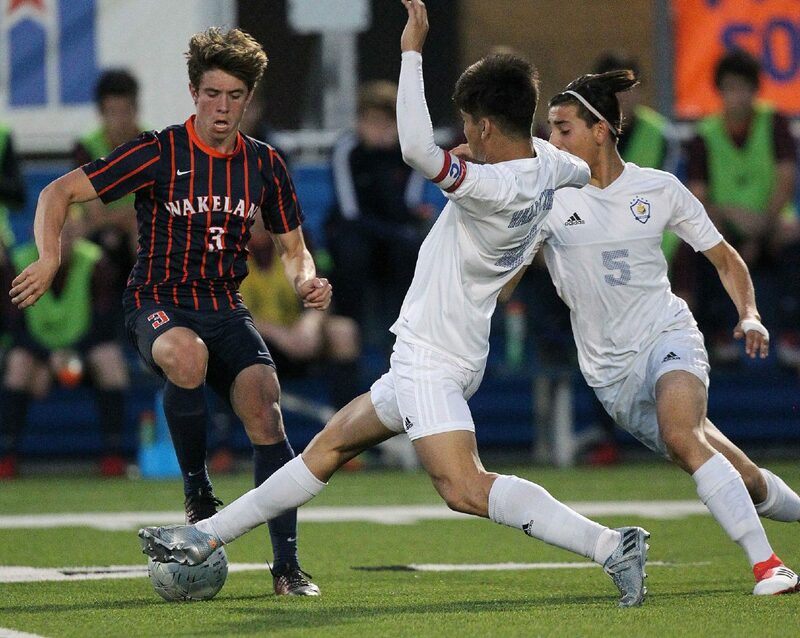 The Wolverines’ Bryson Bezdek was alone on a breakaway to try to extend Wakeland’s one-goal lead when Rodriguez went for a desperation tackle. After two grabs at Bezdek, Rodriguez hauled him to the ground just before the penalty area. 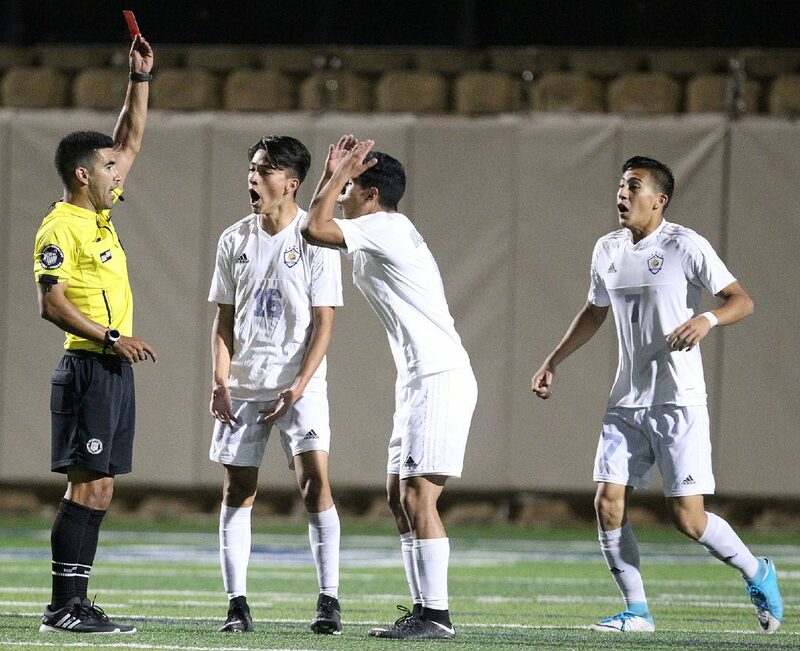 The card was given, and before play could resume with a Wakeland free kick, Valley View’s Emmanuel Acosta was also ejected for arguing the call. When the free kick was finally taken, Jacob Miller curved his shot to the near post and scored the goal that ended any hopes of a comeback. With 4:47 to play in the match, Valley View’s Mario De Los Santos lost his composure after a foul and stepped hard on a downed Wakeland player, earning the 70-goal scorer an early exit. The lone goal marked Valley View’s lowest scoring output in a game since their season opener against Class 6A Houston Aldine, which was a 1-0 victory. The Tigers rattled off 31 consecutive wins before suffering their first loss of the season on Thursday. Frisco Wakeland took the lead just 7:03 into the game. The Wolverines’ lob pass came to Alex Wing, who headed the ball over Valley View senior keeper Elian Chavez before Marc Borbonus tapped it home. The opening goal was perhaps out of place in a half that Valley View dominated in shots (6-1) and possession. The Tigers controlled the ball through the midfield, using their finesse style of play to evade defenders and keep the ball moving. Once the ball reached the attacking third, however, the Wolverines defense swarmed the Tigers forwards and didn’t allow much breathing room. De Los Santos was Valley View’s prime threat, but also the main focus for the Wakeland defense. The second half was a battle during which both goalies made saves to keep their team in the game. 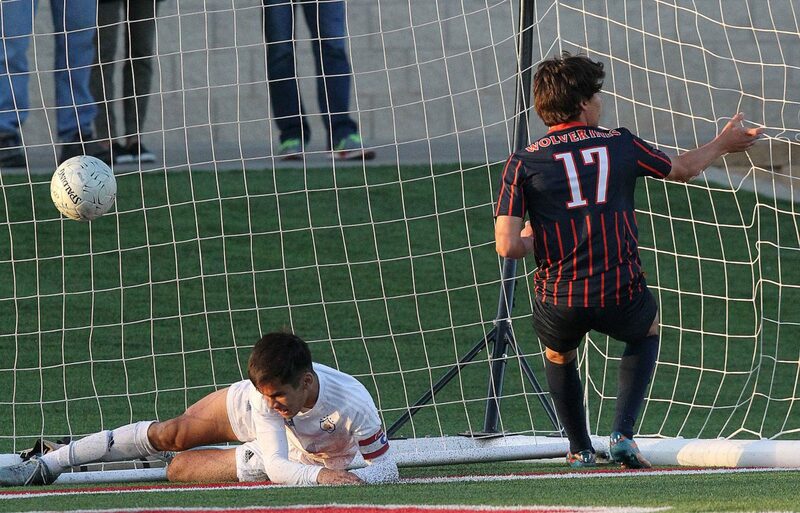 Chavez made four second-half saves, while Wakeland’s Parker Thomas made two. The Wolverines’ second goal of the match came after Chavez lost control of the ball and Bezbek made the Tigers pay for the turnover. Rodriguez had a chance to score his second goal and level the score before his ejection, but his shot after a long throw-in was blocked by a defender in the box. Frisco Wakeland advances to Saturday’s title match against Aledo for a chance to repeat as 5A state champions. Nathaniel Mata covers for The Monitor. He can be reached through email at nmata@themonitor.com or by phone at 956-683-4431.